I love having little girls to sew for, and lately I’ve been having a lot of fun creating new styles for their Summer wardrobes. I’m especially excited to be sewing shorts for them in the first time in FOREVER! Now I know there are already some great kiddie shorts patterns out there, but I kinda like to do things my own way. I get a big thrill out of making something completely new. I also had quite a few specifications from Miss Seven that simply had to be met, namely pockets, pleats, and cartwheel worthiness. These little shorts were also a pretty good scrap bust. You’ve seen the yellow sateen before (here and here) and the printed sateen trim has been around the block too. I don’t know what I’m going to do with all my scraps when these girls get bigger. This entry was posted in buttons, cotton, Lily Sage & Co, Lily Sage & Co patterns, Lily Sage and Co patterns, Mood, pants, self-drafted, shorts, Tessuti Fabrics and tagged cotton, girls, Mood fabrics, pockets, sateen, self-drafted, shorts, Tessuti Fabrics, yellow on April 17, 2015 by Debbie Iles. These are just beautiful! Not too short & not too long. I’ve made shorts for my girls before but they won’t wear them. I think it’s the style of them though, not girly enough! I’m sure next year they’ll want me to make shorts again! Thank you Lee! I’m pretty sure it’s purely the need to do cartwheels ALL day that has prompted this move away from dresses. Woop woop from me! Just found this via Pinterest. 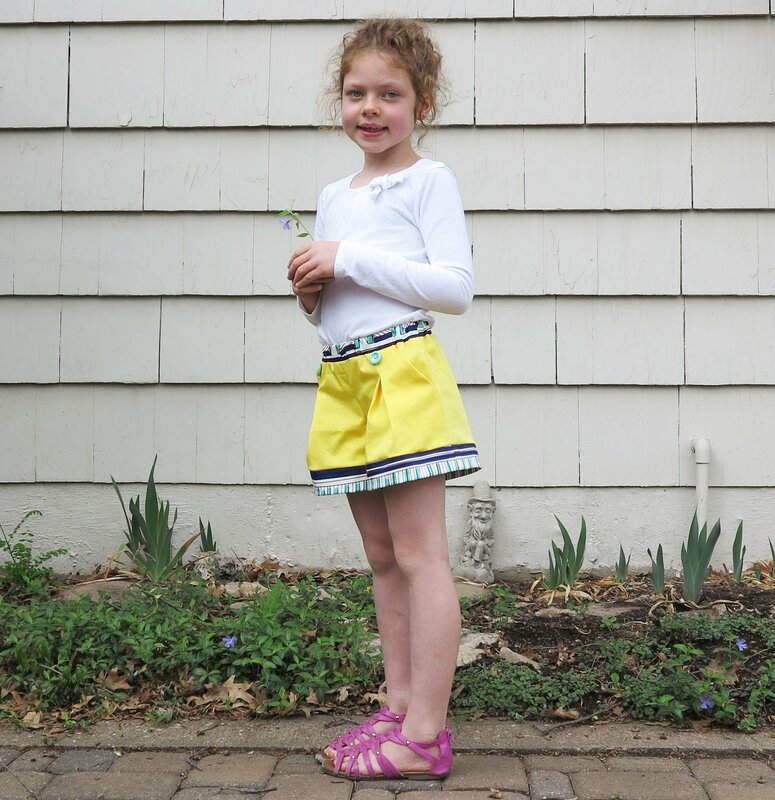 Will you be making a pattern for this cute little short/skirt? My granddaughters would love some! Hi Kathy! Yes, these shorts have been really popular with my seven year old, and I still enjoy seeing her wear them, so it looks like they are passing the test. I’m hoping to start working on this pattern in the next week or two. Oh, good. I can hardly wait. My granddaughters are 4 and 7. Bookmarking this page to keep an eye out for the pattern!